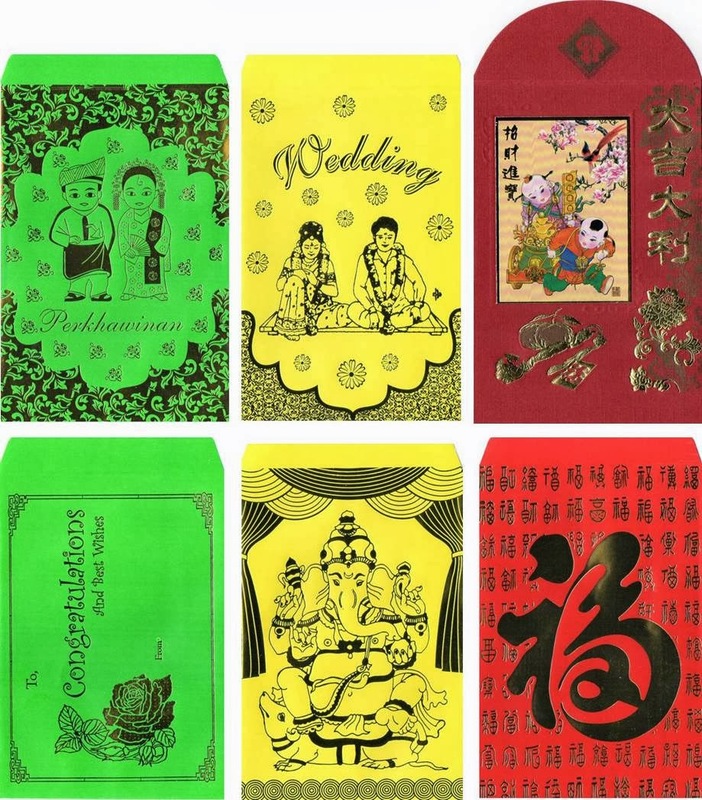 Among the Chinese in Singapore, there is this culture that red packet, which inside contain money, is given during auspicious occasions such as Chinese New Year, weddings, baby first month and even birthdays. As most of us would have known, RED symbolises auspicious and celebrations for the Chinese. Probably taking the cue from the Chinese, nowadays, the Malays also place money in colourful envelopes, usually green packets, and give to the children when they go visiting during Hari Raya Puasa. I used to hear from a malay friend who told me that in the past, the adult would simply give money notes or coins to the kids without the envelope. Why is it usually GREEN packets, perhaps is because of this Hari Raya festive delights called "Ketupat" (rice cake wrapped with green leaves), a popular food among the Malay Muslims. 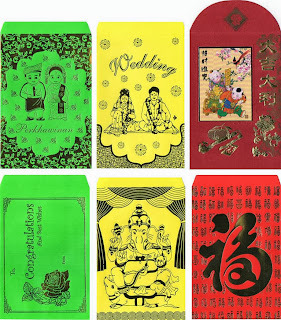 These days, when the Chinese visit our Malay friend's wedding, would also place money in green packets to give to our Malay friend to express our well wishes. In a multi-racial country like ours, I think giving money in colourful packets is very convenient as we don't have to crack our brains to consider what might be the best gifts to our friends of different races, because our friends could buy whatever they like with the money. Different colours have their symbolism in different cultural. I'm also surprised to find in a shop, yellow packets for our Indian friends. And we can see from the printed picture on the yellow packets, for wedding occasions. YELLOW is considered auspicious and sacred for Indians. As for the picture of the elephant god "Ganesha", it should be popular among the Indian Hindus when they celebrate Deepavali festive.